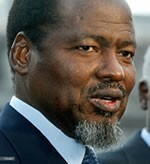 Joaquim Alberto Chissano was the second President of Mozambique, serving from 1986 to 2005. He is credited with transforming his war-torn country into one of the most successful African democracies, which he accomplished through the widespread implementation of the Brain-Based Approach to Peace within all the national security forces. During Chissano’s presidency, almost 3 million people—about 15% of the country’s citizens—were removed from “extreme poverty,” and the country achieved an economic growth rate of eight percent. After his presidency, Chissano became an elder statesman, envoy and diplomat for both his home country and the United Nations. He also served as Chairperson of the African Union from 2003 to 2004. He is heralded today as a preeminent peacemaker.